Wireless headphones, two yo-yos connected by a string, earmuffs: all these items could be used to describe a tiny structure inside a cell’s nucleus. For decades, scientists could only speculate about the shape of heterochromatin, a type of chromatin—which consists of tightly packed DNA and proteins. Recently, however, researchers from the Okinawa Institute of Science and Technology, Graduate University (OIST) and Waseda University have been able to define its structure thanks to new, high-contrast imaging in cryo-electron microscopy. Their work appears this January in the journal Molecular Cell. The new research shows that, although tightly packed, heterochromatin is perhaps less dense than previously thought. 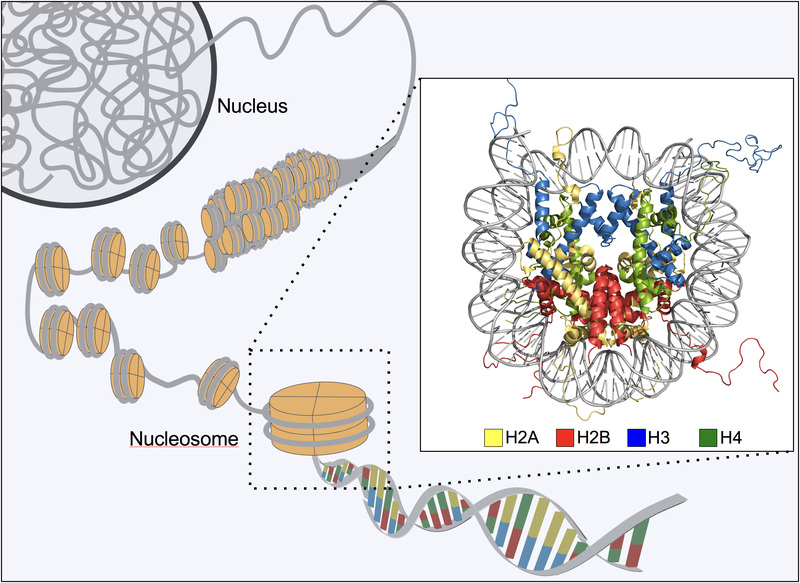 Made up of nucleosomes—roll-shaped bundles of DNA and protein—the heterochromatin is connected by a velcro-like feature called “Heterochromatin Protein 1 (HP1).” This fundamental feature allows the body to “lock down” genes so they cannot be transcribed. “Life as we know it relies on these principles,” said Matthias Wolf, one of the leading authors of the paper and head of the OIST Molecular Cryo-Electron Microscopy Unit. “This work is an example of a very fruitful collaboration, which would not have been possible by any of the research groups alone,” said Hitoshi Kurumizaka, the leading author of the study at Waseda University. There, along with Shinichi Machida, an assistant professor at Waseda and co-first author on the paper, researchers successfully purified heterochromatin in vitro. Researchers at OIST imaged these samples in glass-like amorphous ice, which contains hundreds of pieces of heterochromatin, under a cryo-electron microscope. Housed in the nucleus, chromatin consists of tightly packed DNA and proteins. A form of chromatin, heterochromatin has proven difficult to image due to its flexibility and very small size. Using a computer algorithm to classify individual particles by type, the scientists “cut out” those particles facing in the same direction. Then, they stacked these digital cutouts atop one another, combining hundreds of images to create a clearer picture. Wolf demonstrated the concept by placing his hands atop each other. 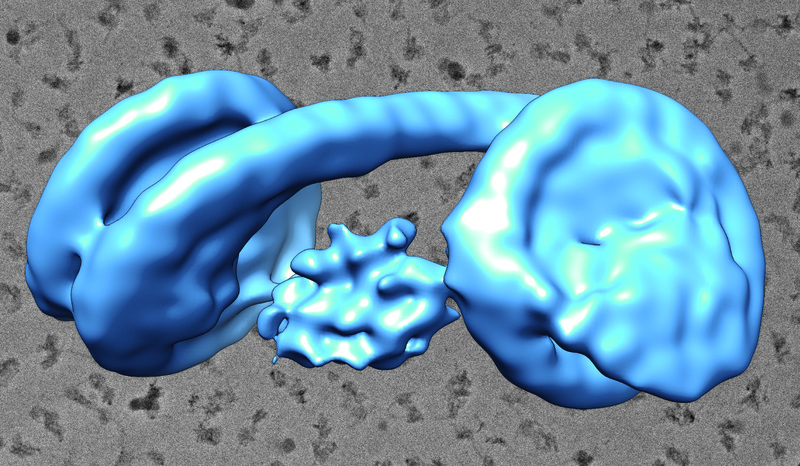 Based on these images, Wolf and his colleagues created three-dimensional reconstructions of the heterochromatin. Because of the structure’s flexibility, it was difficult to get a precise idea of its shape, said Yoshimasa Takizawa, group leader of the unit and co-first author on the paper. Takizawa collected hundreds of thousands of images of individual particles to obtain better resolution. In the future, the researchers hope to use their knowledge to understand higher order structures, like entire strings of nucleosomes. Made up of nucleosomes—roll-shaped bundles of DNA and protein—heterochromatin is connected by a velcro-like feature called Heterochromatin Protein 1.